U.N. High Commissioner for Refugees Filippo Grandi meets journalists at the foreign press club in Rome, Sept. 14, 2018. The top U.N. refugee official says Europe has to agree on how to deal with migrants rescued in the Mediterranean Sea. After two days of talks with government officials in Italy, Filippo Grandi, the U.N. high commissioner for refugees, said Friday that European countries have to unite on addressing migrants arriving in Europe. Grandi was very clear about the need to rescue anyone found at sea in the Mediterranean. He said migrants should be taken to the nearest safe port. Speaking in Rome, he praised the work of the Italian coast guard. Italy recently closed its ports to nongovernmental organization vessels engaged in rescuing migrants in the Mediterranean. 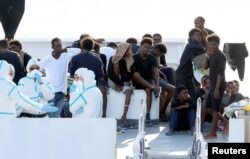 The Italian interior minister, Matteo Salvini, has said he no longer will allow migrants to disembark at Italian ports, and he urged other European states to allow vessels carrying migrants into their ports. Salvini has repeatedly said Italy will not continue to assume the brunt of the migration issue. Grandi said that although the flow of migrants has dropped this year, the lack of NGO vessels operating in the area has brought an increase in the number of migrant deaths at sea. He said he agreed with Italian government leaders on the need to provide more resources to end conflicts in the migrants' home countries and other root causes of the departures. He added that he had discussed with Italy's foreign minister, Enzo Moavero Milanesi, the need to push for the next EU budget to include important resources strategically aimed at stabilizing situations in crisis areas in order to stem unnecessary flows of people. FILE - Migrants wait to disembark from the Italian coast guard vessel Diciotti at the port of Catania, Italy, Aug. 22, 2018. Grandi said people do not want to flee from their homes or end of up in the hands of traffickers. That's why offering economic security alternatives is very important, he said, but this can only occur with resources that go beyond those of each individual member state. It is essential, Grandi said, to establish a mechanism that will deal with the arrivals of migrants and what happens to them after their arrival, and this mechanism must be shared by European nations. He said it was not possible to deal on a boat-by-boat basis, as recently has been the case. The majority of refugees who flee crisis areas go to neighboring nations, Grandi said, but often these countries lack the resources to provide humanitarian assistance. Therefore, he added, transit nations also require reinforcement of institutions to deal with the migrant movements. He explained that at present, the most complex and dangerous transit country is Libya, which is torn by violent conflict. The UNHCR is present in Libya with the International Organization for Migration, he said, because in Libya there is a large population of refugees living in extremely difficult conditions. Many are locked up in detention centers, where the conditions are abominable and completely unacceptable, he said. Grandi said the U.N. works to assist the most vulnerable people and organizes repatriations and humanitarian corridors so that they may find protection elsewhere. He added, however, that these channels must be intensified and that efforts must continue to obtain an end to the conflict in Libya.